The truth is, I was delighted by the opportunity to puppy-sit Apple, Adagio’s littermate. Her puppy-raiser departed on a week-long vacation early Friday morning, so Apple arrived at our house mid-day Thursday. She looks a lot like her younger brother, but Steve and I can tell them apart. Fittingly, she’s a bit smaller and her face is more delicate. Adagio worships her; her arrival triggered paroxysms of joy. Apple is the one on the left. 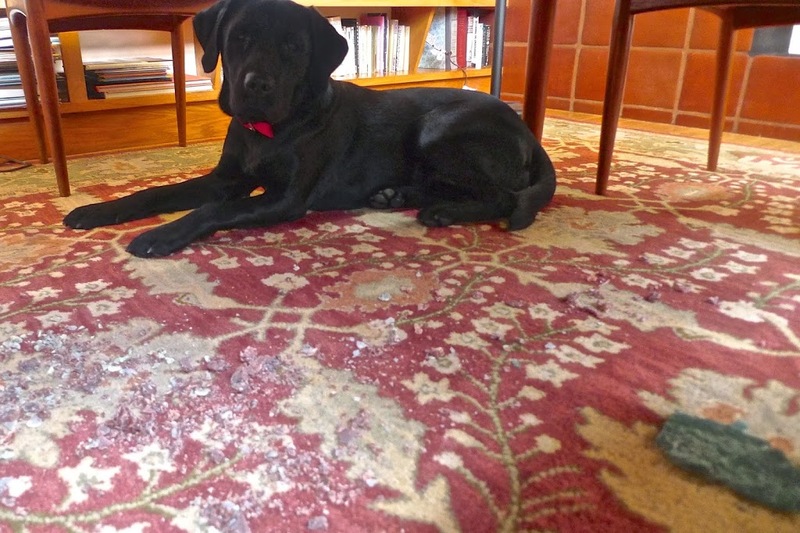 It’s also true that living with two 5-and-a-half-month old labradors is more trouble than living with one. The worst thing about these two is that neither one has learned to ask to go outside, when they need a potty break. To avoid accidents, we have to remember to take them both out every hour or two, and that’s more work with two than one. Still, the pleasure of watching the two of them interact has outweighed the nuisances. They walk beautifully on their leashes, Apple even better than Adagio, so we have taken them with us to the coffeeshop. Steve’s been waiting outside with them while I go in. They seem radiant with happiness to be near each other. And they do periodically crash. Apple will go to another puppy-sitter tomorrow afternoon. We’ll all be sad to see her leave. Beverly passed the one-year mark yesterday. She’s grown into a beautiful and pleasant companion — the easiest CCI puppy we’ve ever raised. To mark the occasion, we should have done something special, but I have to confess we failed at that. It was already something of a dog party, however, given the presence of our grand-dog, Felina, here in Southern California on her first big road trip with our son Michael and his pack. My Movie from Jeannette De Wyze on Vimeo. Steve and I feel almost as puzzled by Felina at times as Beverly appears to be. We live so deeply embedded in the CCI universe, and we’re so accustomed to CCI puppies, it’s eye-opening to suddenly be living with a dog who doesn’t know all our clubby commands for daily life. (Not to mention thinking like a corgi). We’re all getting along, mind you. It’s just educational — and fun for a change of pace. Felina has to be COAXED to eat her breakfast. To Beverly and Tucker, this is… unthinkable. When we first learned about the opportunity to raise Beverly, one of my biggest concerns was that Steve and I had long ago committed to attending a conference in Las Vegas in the middle of July. We couldn’t take a 3-month-old puppy with us to it, and it’s not the easiest thing to find puppy-sitters, even within CCI, for dogs that young. But this was one of the many times the CCI village stepped up. With assurances from various individuals, Steve and I took the plunge. And last week Beverly got an early taste of how interesting life as a CCI trainee can be. First we heard from Lisa Matthews, who’s raising Kora (the former best friend of our last CCI pup, Kyndall). Being 6 months younger than Kyndall, Kora won’t enter advanced training until November. But Lisa gamely welcomed Beverly into the 2-bedroom, upper-story condo she shares with Kora. Although I’ve written a lot already about how sleepy Beverly often is, Lisa reported (after the visit) that being in Kora’s presence electrified our little girl. “She would run across the room and dive-bomb Kora.” Apparently Kora took this abuse in good humor; the two wrestled and played for hours on end. Amazingly, puppies are undeterred by being less than a third the size of their attack victims. Lisa also bravely took both girls on outings — with the aid of our puppy stroller. Happily, puppies who play hard together ultimately crash together. Because Lisa had a social commitment that would take her out of the house for several hours Saturday and Sunday, I turned to two other devoted CCI puppy-sitters, Susan Miller and Frank Novick of Rancho Bernardo. Susan and Frank have helped us with several previous pups, and they are unfazed even by little ones. They picked up Beverly from Lisa on Friday afternoon, texting me, “We have the package. She is certainly a beauty.” In succeeding texts, they let me know that things were going well. Beverly slept Saturday morning until 6:30 a.m. — a new record for her. The social whirl doubtless helped to tire her out. Target only stayed for about an hour. But more fun will be coming to our doorstep tomorrow, when Steve and I will host one of our former trainees, Darby, for a week-long stay while her family vacations in Hawaii. In preparation for that, Beverly is resting up. Unlike most of the the dogs we’ve lived with, Kora appears not to be a member of the Sloppy Sitters Club. She sits beautifully. just a few blocks from us. Even though Kora is 6 months younger, she and Kyndall became great friends and spent a lot of time together over the past 10 months. When Lisa asked us if we could take care of Kora while Lisa attended a conference and went on a Mediterranean cruise, we were happy to do so. Despite our normal conviction that three big dogs is too many, we knew we’d only have three for about 10 days, because Kyndall was turning in. Then for a week or so, we’d be down to just Kora and Tucker. And having Kora around has indeed been a comfort. With Kyndall gone, Kora’s own distinctive personality has come more sharply into focus. She sleeps less than Kyndall, and I’ve been fascinated to see how ingeniously she entertains herself. She chews on her toys (only), and one day I watched her play ball all by herself for a solid hour or so. Most charming of all: Kora does something I’ve never seen from any of the 10 dogs Steve and I have raised from puppyhood (or the countless ones we’ve cared for briefly.) She has a beloved blanket that Lisa told us to put in her kennel every night. Not only does Kora NOT destroy it (as all ourCCI puppies have done with similar blankets), but Kora routinely goes to the kennel and drags the blanket out, hauling it around the house with her and curling up on it. It’s clearly a security blanket, akin to that of Linus from the Peanuts gang. Kora’s ultimate source for comfort will be restored tomorrow night, when Lisa returns from her travels. I expect it to be an ecstatic reunion and will have a video recorder ready. The white stuff scattered all over those stairs is dog hair. Although Steve just vacuumed this room (his office) yesterday, since then it has accumulated a truly shocking quantity of blonde fur. In less than eleven days, we’ll hand over Kyndall’s leash and she’ll be led off to the kennels at CCI’s Southwestern regional headquarters, to begin her Advanced Training regime. We’re feeling sad at the thought of her vanishing forever from our lives, but we believe for her it will signal the start of a much more sociable phase of her life — living and training with dozens of other young comrades, including a kennel mate with whom she’ll spend all her non-training hours. And through a twist of fate, the party has begun early for her. The girls also play so energetically that they mess up the rug in my office. It’s also no small challenge to muscle the girls out to the backyard first thing in the morning. Although Kyndall and Tucker normally sleep up in our bedroom, we think the three of them simply take up too much space, so we’re having them all sleep in Steve’s office. This morning, Kyndall and Kora were so overjoyed to find themselves in each other’s presence at dawn’s early light that all they wanted to do was race around and wrestle, rather than obediently poop and pee. To handle them, Steve and I both dragged ourselves out of bed and trooped downstairs so that each of us could take one of the girls on a leash. That will likely have to be our routine for the next 18 mornings.